Unless otherwise specified, we warrant our products for 1 year from the date of original purchase under normal and non-commercial use. Replacement items, if issued, do not restart or in any way extend the warranty period. All items if returned for whatever reasons must be accompanied by a Return Merchandise Authorization (RMA) Number, which is to be issued upon request through service@laptop-ac-adapter.de. Items returned without RMA# will delay the process or be ignored. Customers are strongly recommended to keep the original postal package for 90 days from the purchase otherwise we are not responsible for the return postage for any reason. 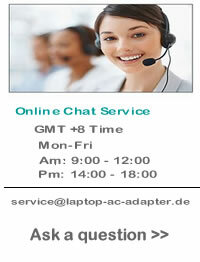 If you are not satisfied with our product(s), please contact us through service@laptop-ac-adapter.de to obtain a RMA Number within fifteen (15) days of purchase. And products must be returned 100% complete, including all components, original boxes and packing materials, manuals, and other accessories provided by the manufacturer. We reserve the right to charge a twenty-five percent (25%) restocking fee for NON-DEFECTIVE returns. - If products are returned to us within 30 days from the purchase day, we will bear all the shipping charges for exchange; and if justified, refund will be made in full. However, products so returned must be 100% complete. If items are returned by express delivery or courier, refund will only cover up to au$10.00. - After thirty (30) days and up to ninety (90) days of purchase, we will refund (excluding shipping and handling charges) or replace any defective product(s). Customers are responsible for paying the return shipping charges and we bear the re-sending charges. - After ninety (90) days and up to one (1) year of purchase, refund request will not be accepted unless a replacement is not available. Customers are responsible for paying all the shipping charges (including the return and resending ones). - Replacement products or refund will be arranged for all faulty products returned, subject to technical test results that justify Customers complaint.